A La Minute, with locations in Redlands and Orange, opened a branch a couple of years in Claremont’s Packing House, sharing a former art studio space with Augie’s Coffee, another Redlands-based business. It was only recently that I checked it out, walking over with a friend after lunch at Crepes de Paris a few doors down. 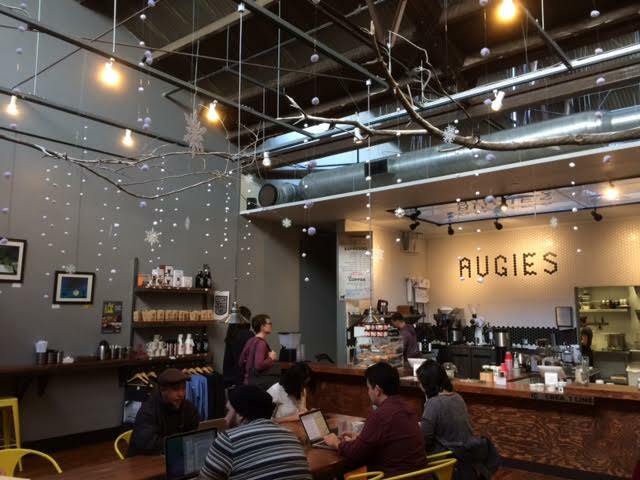 The interior space is large and airy, with modernist communal tables where people sat with furrowed brows staring at their laptops, and winter decor: faux branches suspended from the high ceiling with snowflake designs and lights hanging down. 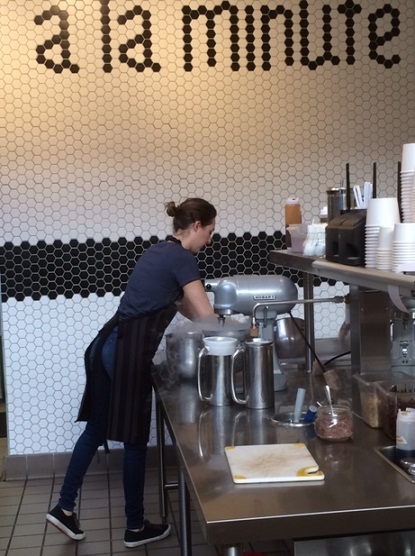 One person handles the coffee and espresso orders at one register, while at the other end of the long counter, someone else takes care of ice cream orders. They make nitrogen ice cream from scratch for each order, like at N7 and Sub Zero in Rancho Cucamonga. Flavors offered appear semi-permanent compared to the more seasonal N7. 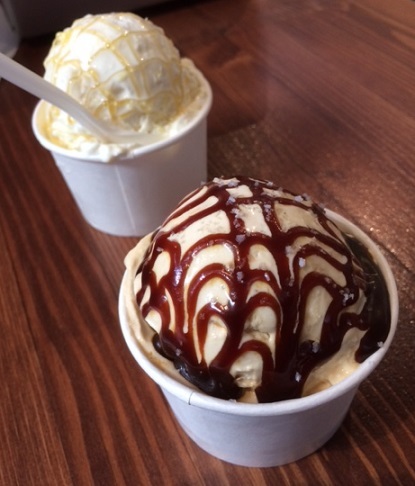 I got orange honey and my friend got salted caramel, both small ($5); a medium is $6, large is $8 and a pint is $10. You can watch the maker in action, with billows of nitrogen pouring from the metal bowl, occasional pouring and stirring, like your food is being prepared by a chemist. It’s not merely a show, though, as the results are excellent. The orange honey had drizzled honey and bits of orange. The salted caramel had an intense caramel flavor. We both were happy with our choices. We could have had one size bigger for an extra buck, but that’s why America is in the shape it’s in. The small was delicious, but plenty. 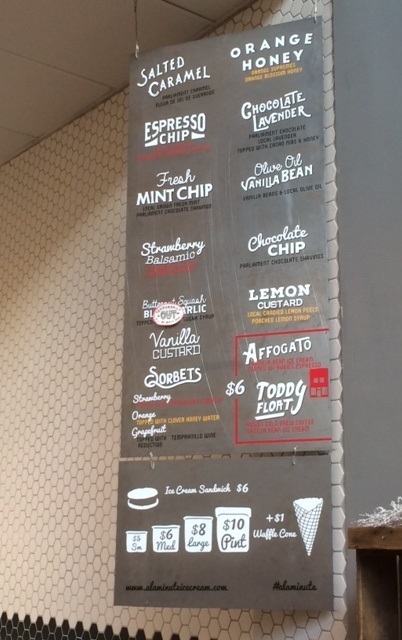 This entry was posted in Restaurants: Claremont and tagged Claremont, ice cream, nitrogen by David Allen. Bookmark the permalink.